Indoor comfort in your home is about more than just adjusting the temperature on the thermostat. Many homeowners overlook the need for necessary components and systems that can improve the indoor air you breathe. Indoor air quality products and systems are quite frequently treated as accessories. We define them as indoor air essentials. A central heating and cooling system offers just the basics with regard to enhanced indoor air quality for you and your family. Consider the fact that the Environmental Protection Agency (EPA) estimates that the air you breathe inside your home could be up to five times more polluted than the air outside your home1. Beyond simply heating and cooling the air in your home, don’t you want the best indoor air possible for your family? 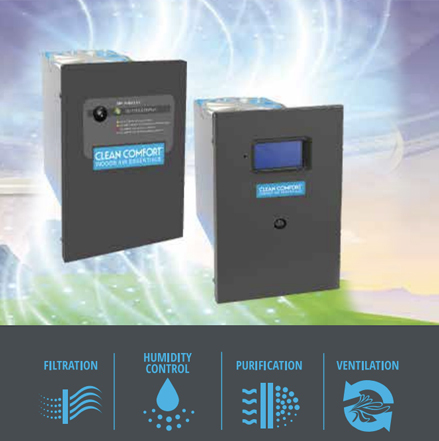 We make it a simple decision with Clean Comfort® Indoor Air Essentials product solutions. Ultraviolet lamps have been used in a wide range of sterilization applications for almost 100 years, including water treatment, food processing and disinfection of hospital equipment. The Clean Comfort brand Air Purifiers employ the same technology by using a combination of germicidal UVC and UVV light to help deactivate microbial contaminants, like bacteria, viruses, mold, and allergens, while also deodorizing the air inside your home. The Clean Comfort brand UV Coil Purifiers for Air Handlers also use germicidal UVC light to inhibit the growth of bacteria, viruses and other microbes such as mold on the evaporator coil of your home’s heating and cooling system. Why Buy an Ultraviolet Coil Filter? Continuous disinfection of evaporator coil which can lower the risk of mold growth on the coil and circulating in your home’s air. UV disinfection of the coil helps maintain your system’s original performance by inhibiting mold growth which would reduce heat transfer efficiency and air flow through the coil. 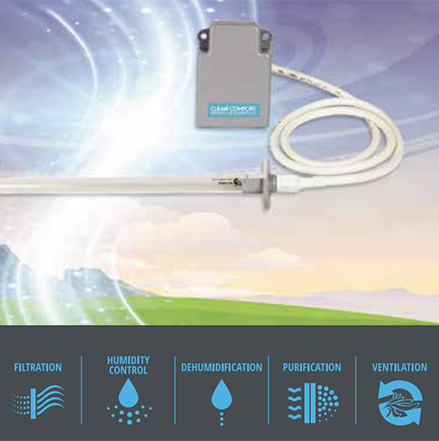 Continuous disinfection of the air in your home, lowering the concentration of mold, bacteria and viruses. High intensity J-shaped UV lamp increases disinfection power in the airstream. Time-tested UV technology used for indoor disinfection in hospitals, food processing and laboratories. Low maintenance — lamp only needs to be changed every 3 years on average. Whole home treatment against airborne microorganisms and odors. Our professional technicians are NATE Certified and qualified to service all brands of equipment. We repair, install and maintain air conditioning units in Collier County, Marco Island, Bonita Springs, Estero, South Fort Myers, Florida. Call 239.404.4755 to talk with Comfort Control AC Specialists today and get a free estimate! Interested in Ultraviolet Air Purifiers?